Victoria said: "What I love about that bookstore is that it has a wide literature collection though most of them are not in English. And the best part about that bookstore is all the books are vintage and are mostly in their first editions. I remembered the bookstore to have two layers. When you step in, the bookstore seems quite empty with all its books kept in glass shelves. However, when my uncle and I expressed our interest in various classic books, the owner of the store brought us deeper into the store through a tiny door. When we went in, we could hardly keep out excitement. All sorts of rare books all in their vintage hard covers lined from bottom all the way to the top near the ceiling. There was an old ladder nearby where we can use. I took a name card from that owner but I am unable to read because it is not in English. I did not buy any books too coz even if there are any English books, they cost a whopping SGD$200 (cca. 94€). I would love to visit this bookstore again if I have the chance to go to Vienna again and this time, I will certainly bring more than enough money to buy as many books as I want." 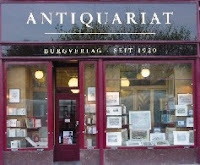 Located right in the heart of the Austrian capital of Vienna, with just a few steps from the famous Opera House and the Museums Quartier standsAntiquariat Burgverlag - a truly antique bookstore, offering used and rare books of all kinds and in various languages. Though most of the books are in German, editions in English, French and other languages can be found there. Burgverlag has been around for almost a century - operating since 1920. It is a place for all the book lovers to come and take a look and browse through their selection of rare and old prints.